I have tried all of the suggestions to fix this problem. What else is there to do. Right now I am running the systm scan throught the command prompt. The last thing I had plugged into my computer before the USB error messsage appeared was my iPod. I have never had any other USB problems besides this one. I have a Toshila A135-S2326 that came with Windows Vista Home Basic already installed. I have the lastest update and BIOS version. I have reset the BIOS to the default seeting and changed the time. I have disconnected the computer from its' source along with the battery. I have disabled all the USB ports restarted the computer, enabled them again. I have uninstalled all USB ports and let Windows reinstall them. I have done everything that I know to do and still nothing. I have read and searched for a solution time and again. Can someone PLEASE help me. I desperately need a solution like yesterday. Thank You!!!!! There is possibly an unbelievably simple solution to the “USB device not recognized ” error which worked for me. I love USB and have 5 ports on my computer so that I can connect my mouse, keyboard, camera, phone, and printer to it all at once! However, last weekend, my computer stopped recognizing my USB devices! The strange thing about it was that the USB ports were not bad because all of my devices were still getting power to them. I could still charge my cell phone without a problem! So I started with the normal fixing methods, including uninstalling the drivers for my devices and reinstalling them. That didn’t work! Next I tried System Restore thinking that maybe I had installed something and it caused a conflict with the USB system drivers. That didn’t work! I read online that in order to fix this problem I should go to Device Manager and uninstall all of the devices under USB Controllers. Restarted the computer, reinstalled the USB drivers, but the problem STILL did not go away! 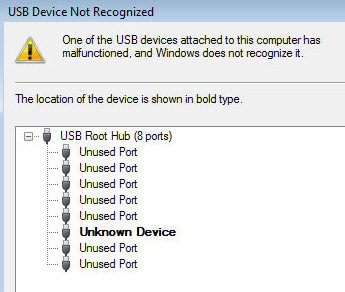 You may also see in Device Manager that the device shows up as an “Unknown Device ”. So how did I finally fix the problem? Well, apparently it’s a super simple solution! No need to edit the registry, uninstall drivers, or anything of that sort. Simply UNPLUG YOUR COMPUTER FROM THE POWER SUPPLY . Yes that’s it! Note that this does not mean just turning off your computer because modern computers don’t really turn off when you press the power button as the motherboard still gets power. First to explain, the motherboard is where all of hardware of the computer is connected to, including the USB ports. Sometimes the motherboard needs to be “rebooted” also because something can go wrong, i.e. all your USB ports suddenly stop working. The small microprocessor on the motherboard will reload the drivers and your USB ports should be back to recognizing all devices! So first turn off your computer using Shut Down or pressing the power button and then UNPLUG it from the wall outlet. Let it sit for about a minute and then plug it back in. Hope this helps someone fix that highly irritating “USB device not recognized” Windows error! Try a System Restore to pick a Restore Point before your problem..
And download the latest USB Universal Serial Bus Controllers for your Model Laptop from toshiba.